techniques based on biochemical and molecular markers are used in many studies related to genetic diversity studies and all biochemistry fields. Kinds of markers change from protein analysis, isoenzymes and PCR-based molecular markers, such as RAPD (generated DNA fragments). Techniques 1. See Takween.com (biochimie et applications en Biotechnologies) . The investigation of genetic diversity of many species is based on electrophoresis technique, which allow the separation of molecules on the basis of their electric charge and their size. In many cases, electrophoresis on polyacrylamide gels is used to carry out the separation. Before this step, extracts are prepared from leaves, in the case of plants. REACTION MIXTURES FOR ISOENZYME STAINING AFTER POLYACYLAMIDE GEL ELECTROPHORESIS. Incubate gels 15 min in 100 ml substrate solution containing: 0,03 g Alpha-Naphthylacetate (in acetone 50%) and Tris-Hcl 0.05 M pH 7,2. + Rince gels 2 times with water. min and remove substrate solution. Incubate during 15 min gels in 100 ml substrate solution containing 250 mg Aspartic acid + 100 mg Alpha-ketoglutaric acid + 50 ml Tris-Hcl 0.5 M pH 7,2 50 ml. A 50 µl reaction mixture is used in the DNA amplification by RAPD. Various mix could be essayed. 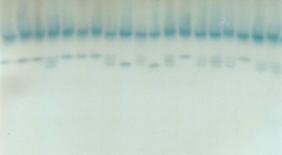 Polyacrylamide gels (7%) prepared in TBE 10 x were used to separate DNA fragments amplified by RAPD. 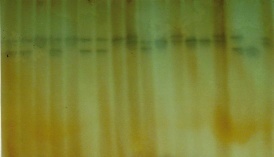 After electrophoresis at 150 volts during 4 hours, gels were stained by silver nitrate (Bassam et al., 1993). Hind III digest of lambda phage DNA is used as molecular weight markers.